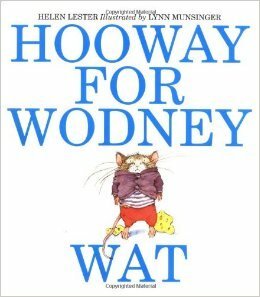 Picture Book Review: Hooway for Wodney Wat should be called Hooray for Rodney Rat, but the main character Rodney has trouble pronouncing his “R’s”. This is a clever, literally laugh-out-loud book that the munchkins love reading over and over again (seriously, it doesn’t get old, even for me). The book deals with the topics of fitting in, bullying and overcoming challenges. It is written by Helen Lester and illustrated by Lynn Munsinger, a dynamic book duo who produce the most entertaining books. I know without a doubt that any story by these ladies is worth the read. You can listen to Hooway for Wodney Wat online at this cool website that reads books aloud (though the video isn’t clear enough to see the illustrations). To see the book in its full glory, purchase it here on Amazon.com or check it out at your local library. Side note: You’ll also want to check out the Tacky the Penguin books by Lester and Munsinger, which feature a penguin who does everything in a tacky way to the horror of his buddies Goodly, Lovely, Angel, Neatly and Perfect – don’t you love those names, haha! You can get a look at one of the books in this video that’s super clear and fun to watch. Jam Review: The “Thankfulness Song Medley” is from Veggie Tales, which has produced some of the silliest songs ever known to mankind. This song however is more on the serious side and highlights the important attitude of gratitude. I didn’t really pay attention to the lyrics until one day I heard C singing, “Because a thankful heart is a happy heart” from the backseat and I was like “yeah, man!”. It’s short and catchy and sweet. Do you have a picture book or kiddie song you’d recommend? This entry was posted in Mamahood and tagged Helen Lester, Hooway for Wodney Wat, kids, Lynn Munsinger, PB & J review, Tacky the Penguin, Thankfulness Song Medley, Veggie Tales.